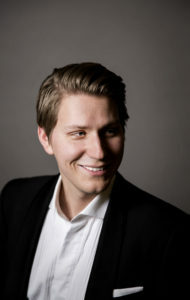 Ole Aleksander Bang is a tenor with Norwegian roots, raised in Sweden, who in spring 2017 graduated from the master’s programme at the University College of Opera in Stockholm. Ole Aleksander has been focusing on Bel Canto-repertoire such as Rossini and Donizetti, but also sings several roles from the Mozart-repertoire. In concert he has performed e.g. works by Britten and Handel. Among recent and upcoming engagements to be mentioned are Christmas concerts with the Stavanger Symphony, New Year’s concerts with the Stockholm Symphonic Wind Orchestra, 1st Chief Techincian in Blomstedt’s Aniara at Malmö Opera, Don Ramiro in Cenerentola at the Royal Opera in Stockholm and Almaviva in The Barber of Seville at the Gothenburg Opera.